Travel is changing. We keep you on top. Hidden down an unassuming lane in Jaipur’s residential Civil Lines district, 28 Kothi brings a new level of luxury to the guesthouse experience. 28 Kothi is a joint venture between Siddharth Kasliwal (Co-owner The Gem Palace) and Honawar Hospitality, it opened its doors in early 2016 to instant acclaim. It was envisaged as a place for Kasliwal’s clients to stay that would be “as extraordinary as the jewels they come to Jaipur for”, and is filled with stunning objets d’art and eye-catching commissions. With just five stylish rooms, a lush garden, a peaceful library and a bijou spa, the atmosphere is particularly special; intimate and welcoming, and ideal for solo travellers as well as couples. There’s no restaurant or formal menu; meals are made to order using farm-fresh vegetarian ingredients – you’ll breakfast on the porch and dine under the stars at night. But most seductive of all is the peace here – it’s a true urban oasis. You’re more likely to hear the resonant call of a peacock than the thrum of traffic, yet Jaipur’s ‘Pink City’ and its numerous attractions are just a tuk-tuk ride away. Interiors lovers will lust after designer Nur Kaoukji’s flawless rooms. 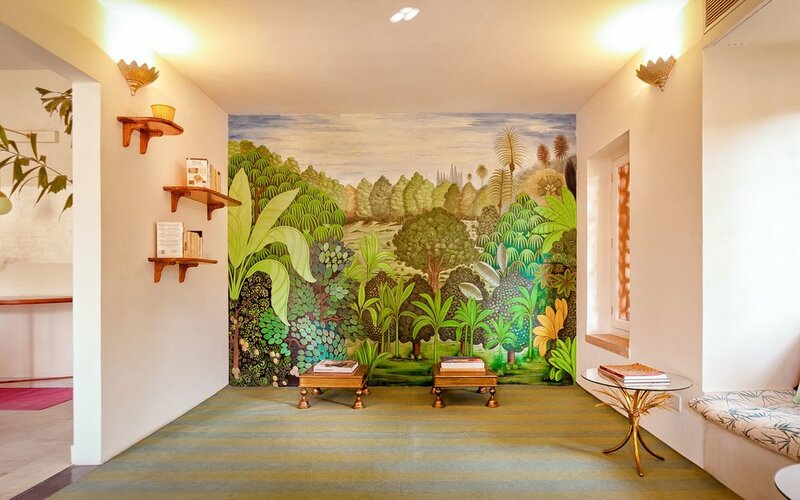 Her passion for the organic percolates its way throughout the entire property, from the miniature Indian mural in the library to the palm prints and bespoke Rajasthani furnishings in the bedrooms. Each of the five is decorated in the colour palette of the gemstone that bears its name, and ornate beds have mirrored headboards worthy of a Maharani. The largest suite, Sapphire, has a floor all to itself and doors leading out onto a private terrace; perfect for couples who want complete privacy. Topaz also has a private terrace – a welcome extra for a standard room – whilst the other standard Spinel has a lovely cushioned window seat. Suite Moonstone is the only room with a bathtub (a fabulous, deep-soaking affair), and Peridot is a great-sized single room that’s excellent value for long-stay guests or families with an older child. Co-owned by culinary legend Abhishek Honawar, you’d expect the food here to be first-class – and by all accounts, it is. With an emphasis on the freshest food of the best quality, meals are strictly vegetarian with international flavours, market produce dictating the daily-changing menus. On balmy evenings, dining under the stars is a real treat. We love the sound of a chickpea and vegetable Moroccan stew served with warm herbed couscous, or a spicy Rajasthani thali with gluten-free chapatis and chilled cucumber raita. Come morning, a continental or Indian breakfast is served on the terrace – try the Rajasthani version with green split-pea pancakes and an exotic fruit salad. Teas are sourced from Goa (marigold, saffron, lemon green tea), coffee is roasted in Delhi, and the Bhuira strawberry preserve and bitter orange marmalade are handmade in a local village. Provenance is paramount here. Reliable WiFi, bathrobes and air con are welcome extras, and toiletries by KAMA Ayurveda are a fragrant treat, with old soup ladles for soap dishes. Best time to go: October to early April, when it’s warm and dry, is the best time to visit. December, January and February can be cold in the mornings and evenings, though warm and sunny during the daytime. March and April are fairly hot. In May and June it gets humid and the heat can become intense and uncomfortable. The monsoon breaks in July and lasts until September. January sees the city play host to the Jaipur Literary Festival and bookworms from around the world descend. Top Tips: For the best insider’s guide, bring a copy of Fiona Caulfield’s Love Jaipur, which is filled with local tips such as the splendid Saturday Hatwara flea market; whilst fashionistas can create amazing souvenirs at the Anokhi Museum of Handprinting, where you can block-print your own shirt! For direct bookings click here.